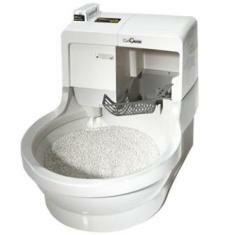 The automatic cat litter box is the newest innovation is the cat box market. Going by the number of electronic units seen in the market, it is obviously a favorite amongst cat owners and cats alike. It makes for good, hassle-free cat care! 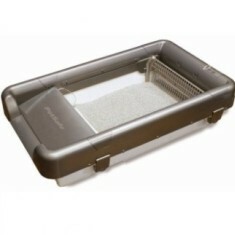 These units are relatively expensive when compared to the traditional litter pans and trays. But then the advantages are well worth the initial outlay. There are self-cleaning and self-washing units available which we review here. The self-cleaning cat litter box, as the name implies relieves you of your daily litter scooping chores. This leaves you more time to spend with your precious cat! Another advantage with a self-cleaning unit is that you only need one unit for multiple cats. Now that's a win! It keeps the cat litter clean by removing kitty waste via a raking action. Solid waste is deposited into a waste receptacle and this can then be removed, emptied and discarded. There are various models available, each with its own features and benefits. The electronic cat litter box should be easy to assemble, easy to operate and even easier to clean, so look for these features. Obviously the price decision is yours. Depending on the brand that you choose, it will either have a programmable digital timer that when activated rakes away kitty waste or a smart motion sensor for triggered activation of the cleaning cycle. Also check that the litter box that you purchase has a dual power option i.e. can run off electricity and switch to battery in case of an electricity outage. 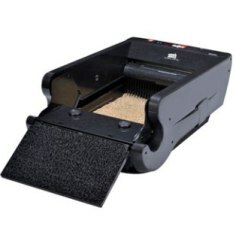 An automatic cat litter box should have an easy-access ramp, this will allow your cat to enter the litter box with ease. Ramps should also have a cat litter mat function, removing particles of cat litter from your cat's paws after using the litter box. Consider a unit that has a motion-sensor activated deodorizer - trust us, you'll welcome the fresh aroma! Some units have the option of a large tented cover - ideal for a shy cat! 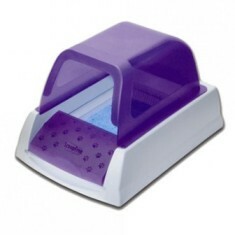 Finally, make sure that your automatic cat litter box comes with the necessary cleaning equipment. Some cats may be afraid of using electrical or automatic litter boxes. The manufacturers provide instructions on how to introduce your cat to its new litter box. Do keep in mind, that the unit will need to be 'spring cleaned' once a month. The latest innovation available to cat enthusiasts is the self-washing litter box. 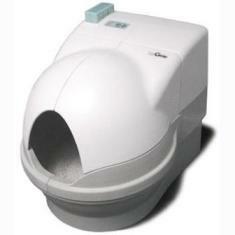 A self-cleaning cat litter box could be described as a combination of a toilet and washing machine. 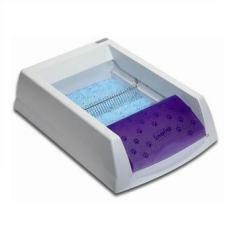 This electric cat litter box utilizes special washable, re-usable litter granules which satisfies your cats need to scratch and cover. There is no need to purchase cat litter. It works by dissolving cat waste by water circulation and then flushes the dissolved material down the drain and sewer system - where it belongs! A special sanitizing solution de-contaminates the granules and cleans and deodorizes them. A hot air dryer blows air over the granules leaving them dry, clean, fresh and ready for the next kitty to use! For those not-so-handy handymen, you may need to get a plumber to help with installation - but it's worth the effort. Price is a consideration with the automatic cat litter box, but think of the savings on cat litter and the positive effect on the environment. Some cats may be afraid of using electrical or automatic litter boxes. There are manufacturer's instructions on how to introduce your cat to its new litter box. The deodorizer and cleanser scent may not appeal to either you or the cat, so inquire about the scent-free version. Whilst automatic litter boxes may be self cleaning, you will need to give the unit a 'spring clean' every 3 - 4 months to keep the unit in good working order. There have been several reports of excessive tracking of the special re-usable litter granules. On our shopping trip we found a range of brands. We are not in a position to recommend any of these brands, we provide information and allow you to make an informed decision about which brand would best suit your requirements and pocket.